As the trees along the Whiskey Rapids Trail in Algonquin Provincial Park in Ontario, Canada change into their Autumn hues, thousands of people wander the trails to see the beauty of the park. Yellow, brown, red, green and orange leaves draping from the branches are near the end of their term and will eventually decorate the landscape below. The looped trail runs alongside the Oxtongue River and the Whiskey Rapids where a mass of Autumn colored trees adorn the banks on either side of the river. The entire hike is about 2.1 kilometers and fairly easy to complete with a steep downhill at the beginning of the trail and an uphill hike at the end. The road leading to Whiskey Rapids Trail leaves from Highway 60 and winds up the hill to the small parking lot at the beginning of the trail. The Whiskey Rapids Trail is like no other throughout Algonquin Provincial Park and is well worth seeing while visiting Ontario, especially during the Autumn when the leaves are changing. 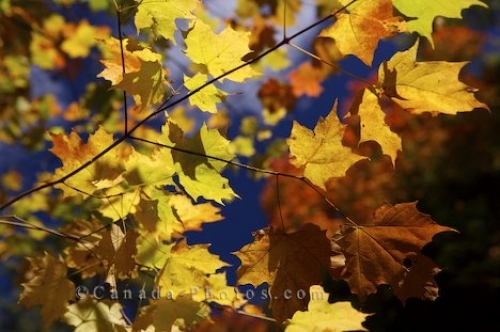 Picture of the vibrant colored Autumn leaves on the trees along Whiskey Rapids Trail in Algonquin Provincial Park in Ontario.